Posted 9:45 pm by admin & filed under Blog. With online advertising, it’s become clear that some firms offer online space–but few impressions or returns. With modern out-of-home advertising, companies need to put the emphasis on attention metrics, rather than simply buying space. While the importance of viewability can’t be underscored, retailers must know exactly how they’re leading their customers from ad viewing to product buying. The analytics platform known as Placed is leading the charge for more detailed and meaningful metrics for outdoor advertising. In fact, it’s key for modern advertisers to view their relationships with platform owners as partnerships. Firms such as Impax Media can help advertisers maximize their ad budgets, for example by leasing advertising space in the check-out line to improve consumer mood and engagement. Whether online or out of the home, advertising must be relevant to the consumer. Modern outdoor advertising is always location specific. Advertisers can maximize this feature of billboard or e-billboard advertising by offering ads that touch on local issues or venue-relevant activities. Posted 8:55 pm by admin & filed under Blog. Times Square recently became the home of the largest billboard in history. This interactive billboard features a screen by Mitsubishi Electric that’s the size of a football field. The Diamond Vision AVL-ODT10, as it’s known, delivers a pixel density of 2,368 x 10,048, exceeding 4K display resolution by 15 million pixels.Google has become the first company renting this prime advertising space in a campaign that will last through January 31. Not only do they get exclusive advertising rights to this space–through the prime holiday shopping season and Times Square’s New Year’s Eve celebrations–but the tech giant has unveiled new, state-of-the-art technological features, as well. One campaign, which ran for two days, offers consumers the opportunity to “Androidify” themselves on their own smartphone. By customizing OS android mascot, users can create an avatar that looks like themselves, their friends, or their family–and then project it on the largest billboard in the world through use of an exclusive Android app. They can also have their characters printed on t-shirts and postcards. Google’s plans for this expansive advertising space include other campaigns for their own products. But they also have their eye on charitable campaigns featuring the World Wildlife Fund, Charity Water, and more. It’s unclear precisely how much Google paid for the space. However, reports to Ad Age state that ordinary outdoor billboard space in Times Square can run as high as $4 million a year. Dunkin’ Donuts, for example, pays $3.6 million a year for its One Times Square digital sign, and Brewer Anheuser-Busch InBev pays $3.4 million a year for neighboring space. Posted 11:49 pm by admin & filed under Marketing. When considering their advertising budget, many companies limit themselves to social media campaigns and costly TV and radio advertising. But road trip favorite Cracker Barrel is leading the way in craft an advertising campaign with timeless appeal. The restaurant commits nearly 50% of its advertising budget to billboard ads, according to eMarketer. Their charming, southern-style restaurants are often located near exits and major highways in order to attract travelers on long distance journeys, so an extensive billboard advertising campaign is a natural fit for their business. And it’s proven to be a very effective strategy. The corporation has experienced annual growth of over 10%. There’s no need to reinvent the wheel. When you see an advertising strategy that’s worked well for other brands, consider designing a similar campaign for your own product and audience. This strategy worked well for the grocery delivery app Instacart. According to an interview in AdWeek, their online media strategy was seeing declining returns in 2014. Their former media manager chose to pattern their new campaign after the subway billboard campaign he saw utilized by other companies. Though the subsequent growth was difficult to quantify, Instacart enjoyed a surge of online subscribers. Unlike online advertising, an outdoor media advertising exists in a rich–and sometimes distracting–physical environment. To increase the impact of your billboards, use eye-catching designs that can be easily read from afar. And consider ways to increase user interaction with these ads. A hashtag campaign embedded in a billboard can increase reach, as consumers take quick snaps with their smartphones and share them in online spaces. Online ads on social media are viewed quickly and then dismissed. However, Americans spend huge amounts of time in their cars, particularly those in congested areas or with long commutes. Carefully placed advertisements in prime real estate could be viewed for far longer than other advertising. A deliberately planned outdoor advertising campaign can help even companies who primarily do their business online. According to Investor’s Business Daily, companies like Amazon and Netflix are some of the biggest spenders when it comes to outdoor advertising. Just because you’re embarking on an outdoor advertising campaign doesn’t mean you have to forgo new strategies for interaction, design, and more. Smartphone and tracking tech can give you extensive data about who is viewing your ads and when. Outdoor advertising can be combined with interactive elements, like lights which illuminate when ads are being viewed, sample dispensers, and more. By pacing your ads in outdoor spaces, you’re guaranteeing views–and expanding possible returns. Ads carefully placed on gas station pumps, subway cars and stations, and traffic tunnels integrate seamlessly into the modern landscape, increasing your returns on your advertising investment. Posted 5:03 pm by admin & filed under Marketing. Brands are directly engaging more and more with customers. By bridging the divide between company and consumer, brands are able to develop personality, garner buzz, and stick in people’s minds. Billboards are the perfect way to engage with potential customers in a long-lasting way. We’ve mentioned before billboard’s impressive statistics when matched up against television and radio. 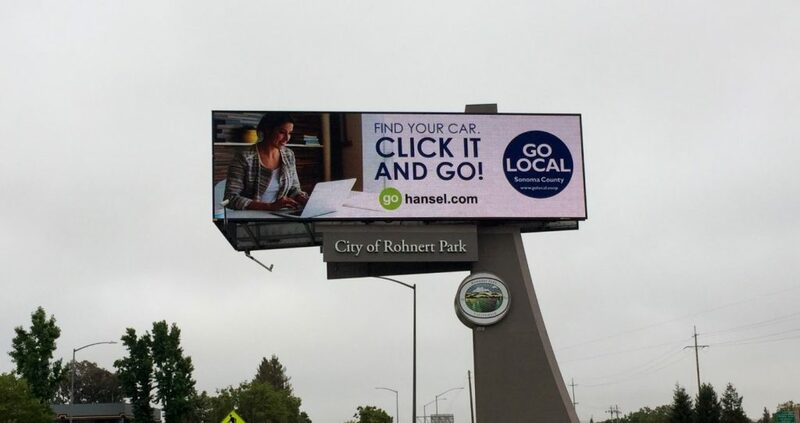 Since people can switch the radio station, turn the television channel, or close online advertising on a smart device or computer, billboards offer a unique opportunity to engage directly with consumers. Recently Veale Outdoor Advertising offered businesses a chance to put a picture of their mother and their company logo along with a message for Mother’s Day on our digital billboard in Rohnert Park. This is an excellent way to get people involved in your product or service! Small and large businesses responded with personalized messages to moms; see below for advertisements from Jelly Belly and SK Creative. This was a fun and interesting way for brands to engage with customers using our billboard, with impressive results. We saw an increase of participation of 600% compared to previous attempts at offering free time on the billboard.We saw an increase of 200% of businesses interested in doing business with us compared to a normal business day. Brands – and customers – are loving the personal approach! Outdoor advertising remains one of the best ways to grab people’s attention and get them talking about your brand. See Burger King’s recent proposition using their outdoor marquee board asking a nearby Wendy’s to prom. This simple sign has captured the Internet’s attention and brought national exposure to Burger King, signifying the power of outdoor advertising when it comes to connecting with customers. Billboard advertising is more cost effective than television and radio while giving you a chance to personally connect to existing and new customers. So our questions is…how are you engaging customers directly with your brand? Does your brand have a voice? Billboards give you a chance to use that voice to connect directly with your base and expand to new customers.The personal Mother’s Day ads were an excellent example of the significant role billboards can play in getting customers active with your product. Talk to us today about getting people engaged with your business. Thank you from the team at Veale Outdoor Advertising. Posted 10:45 pm by admin & filed under Blog, Community. 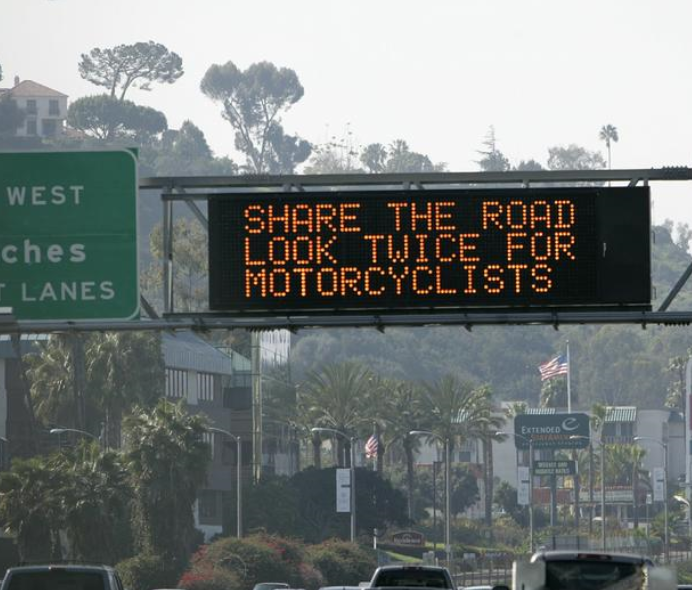 Californians are accustomed to seeing changeable outdoor message signs run by Caltrans. They usually have public safety messages, Amber Alerts, and traffic directions. These Caltrans boards are an important service to the community and Californians have agreed this is the appropriate type of information that should be on our highway and freeway’s public spaces. Californians want to keep our public right-of-way space free from commercial advertising. Instead of acknowledging the importance of the existing system, and the important relationship between advertisers and local government, state Assembly member Kevin Mullin has authored a bill that would steamroll over this successful approach that has been working for many years. AB 1405 leaves our public roads open to total commercialization and blight. Not only that, this bill also wrestles away local government control and completely ignores the public’s wishes regarding outdoor signage. It shifts critical local revenue out of the hands of local government and sends it straight to Sacramento. While Mullins claims this bill will generate millions in revenue each year for the state of California, what he fails to mention is the enormous impact this would have on existing municipal governments and residents. AB 1405, would completely destroy long-term, productive public-private partnerships that many local governments in our state enter into with outdoor signage companies. The economic benefits of billboards would be ripped from local county and city governments, as well as local businesses, and handed over to Caltrans in this power grab. The profits are presently shared between neighborhoods, residents, and local businesses. Municipal governments often negotiate billboard agreements that provide ongoing revenue to support public safety and other initiatives in exchange for the use of public property. Currently, the billboard industry supports local business and local government initiatives. AB1405 will eviscerate that business, instead giving the revenue to Sacramento. To learn more about this power grab, read this article. Most importantly, get involved before the vote. Protect your highways! Keep public thoroughfares in California free and fair to the public! Senator Bob Wieckowski, California Senate District 10 – 916-651-4010 –phone is best! Senator Ben Allen, California Senate District 26 – 916-651-4026 – phone is best! Senator Ted Gaines, California Senate District 1 – 916-651-4001 – phone is best! Posted 6:14 pm by admin & filed under OOH Advertising. Advertising is unique to your brand. For some companies, they may have the marketing budget to support broad campaigns through every outlet. For most companies though, particularly the many local and regional businesses we work with, it is a careful balance to find the right place for your advertising dollars. You want to minimize wasted money while maximizing efficiency. 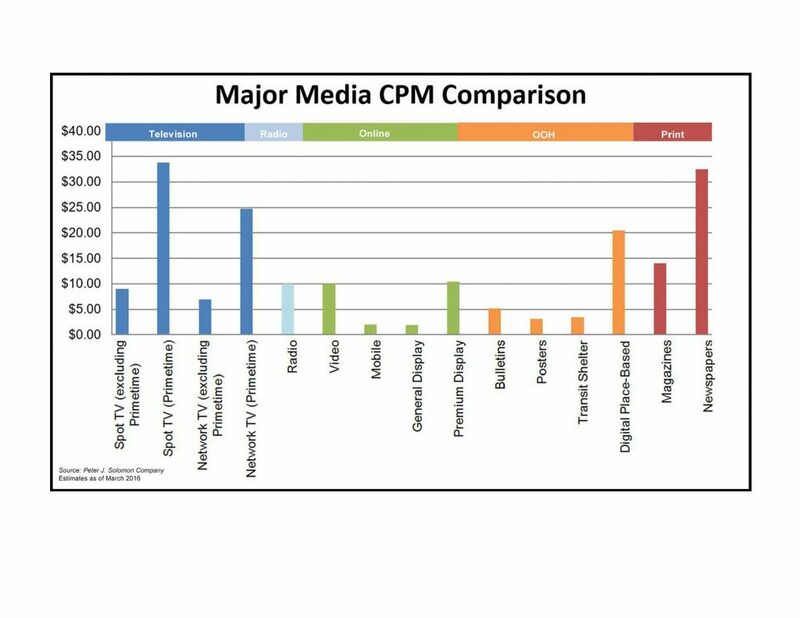 As you can see by the graph, billboards are significantly cheaper than television and traditional media advertising. Although there are many different forms of advertising, out of home advertising – billboards – remain one of the tried and true methods of grabbing customers attention and reaching a targeted geographic audience. When compared to traditional print media, television, and radio, billboards cost far less and deliver higher retention rates. According to a study by the Outdoor Media Centre, 74% of those surveyed remembered a billboard advertisement, compared to 58% for online, 52% for newspapers, 46% for magazines, 37% for radio, 26% for cinema, and 16% for mobile. The same study went on to find that two thirds of people have searched the web for a product/service and one third have purchased as a direct result of OOH advertising. That’s pretty exciting news! If you have a radio or television advertising for your business, OOH advertising can add depth and reach to your campaign. Billboards are the extremely cost-effective for advertising. They provide a striking visual component that is missing from radio, and add a localized element to cable advertising. If you’re ready to make your advertising dollars work harder for you, contact Veale Outdoor Advertising regarding traditional and digital billboards that capture attention, stick in consumers’ minds, and translate to sales. Posted 12:38 am by admin & filed under Blog, Marketing. Billboard advertising is a big powerful and eye-catching way to broadcast your message. So everyone’s question is how can we become involved even if budget is an issue? How can you maximize your marketing budget while also maximizing ROI. Many small businesses have now made use of what’s called shared spots. Through sharing billboard space, businesses can harness the power of outdoor advertising! For small and medium sized businesses, billboard sharing is a unique opportunity for the smaller guys to use advertising that is often commandeered by the national brands. This is an incredibly cost-effective solution to get your business’ advertisement in front of thousands and thousands of drivers and passengers. 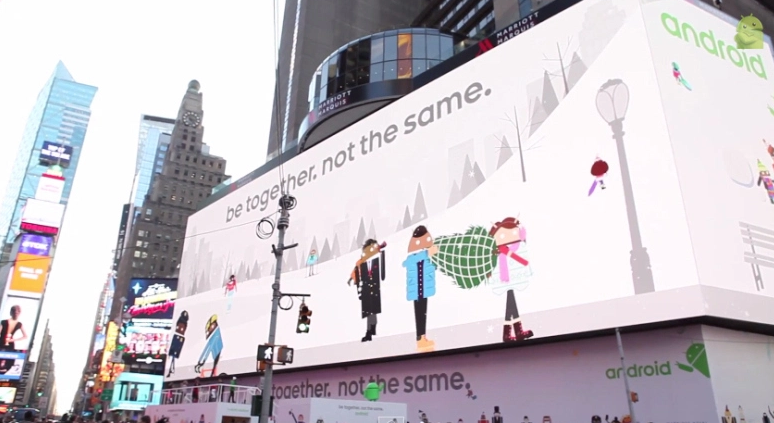 With a digital billboard, multiple companies can share a 6 second spot. By sharing with other companies to fill the spot, your company gains the advantage of the entire billboard at a fraction of the cost. As many as 5 companies can share a single spot and still be effective. How does this work? 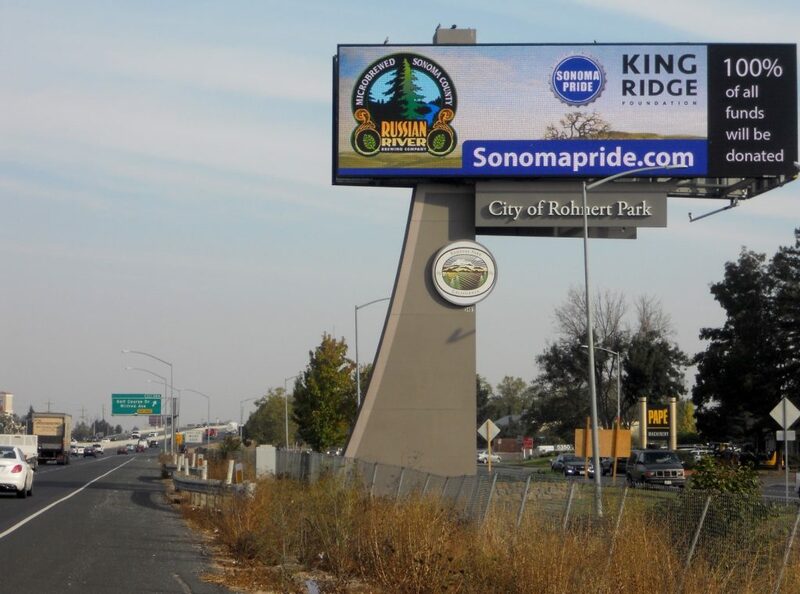 Veale Outdoor Advertising has a state-of-the-art, proven effective digital billboard in the Sacramento/Dixon area. Thousands of commuters traveling through Fairfield, Vacaville, Davis, Sacramento, and Dixon see this billboard on a daily basis. On a weekend or during rush hour, people sit in traffic for extended periods of time, sometimes spending as long as 2-5 minutes in front of this billboard. Because you are sharing the cost of the billboard spot, this is a way to access the advertising power of billboards and it stretches your budget further. For example, instead of running a full spot ad the two weeks before an event, sharing a spot allows you to run that ad for months leading up to the event. Showcasing your advertisement for a longer period – say over several months – is much more effective than showing it for only a week or two. Because it is less expensive on a per month breakdown and it spreads the time you can afford the ad, sharing a billboard spot gives you longer exposure and allows you to stretch your budget. Case studies of our local customers in the Northern California show how much notoriety they get on the boards and how thrilled they are with the results. Sharing a spot might just be the ticket to wildly promote your business – contact us to learn more about billboard sharing and see what kind of companies we would connect you with! Posted 9:52 pm by admin & filed under Community. 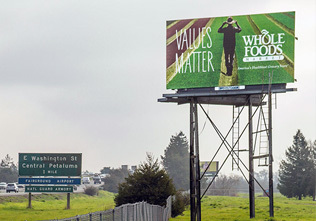 You’ve seen Veale Outdoor Advertising billboards throughout Northern California. We work with many national brands that are widely known, such as McDonald’s, Toyota, Honda, and Jack in the Box. In addition to these major players, we are also proud to work with a number of local companies such as Amy’s Drive Thru, Summit State Bank, Redwood Credit Union, and the Green Music Center. One group in particular that we enjoy working with is GO LOCAL. GO LOCAL is an economic development marketer that only works with local businesses in Sonoma County. The aim of the association is to support local businesses so that cash flow stays within the community, and the community as a whole can benefit from that increased cash flow. Veale, as a Sonoma County based business with 35 years of experience focusing on local advertising, joined GO LOCAL years ago. Their focus on community economic development resonates with our long standing contributions to the area. Through this association, many local businesses get exposure and advertising that they wouldn’t normally have access to such as outdoor media. Through our partnership, Veale puts GO LOCAL advertisements in front of thousands of drivers and passengers on their daily commute. We are happy to work with this local organization to support homegrown businesses. We are stronger together. GO LOCAL operates in Sonoma County. Their work assists locally owned businesses grow their share of market sales in Sonoma County and the surrounding region. In turn, this keeps more of those spent dollars recirculating in the county. However, there is no reason that a similar organization wouldn’t be able to offer the same services in other areas of Northern California. In the past 9 years, GO LOCAL has generated over 3 billion gross media impressions carrying their singular message. This is an excellent model for small and mid-sized businesses in Northern California looking to maximize their marketing dollars. In the next blog, we will tell you the best way to work with other businesses to maximize your outdoor budget. Posted 12:09 am by admin & filed under Community. 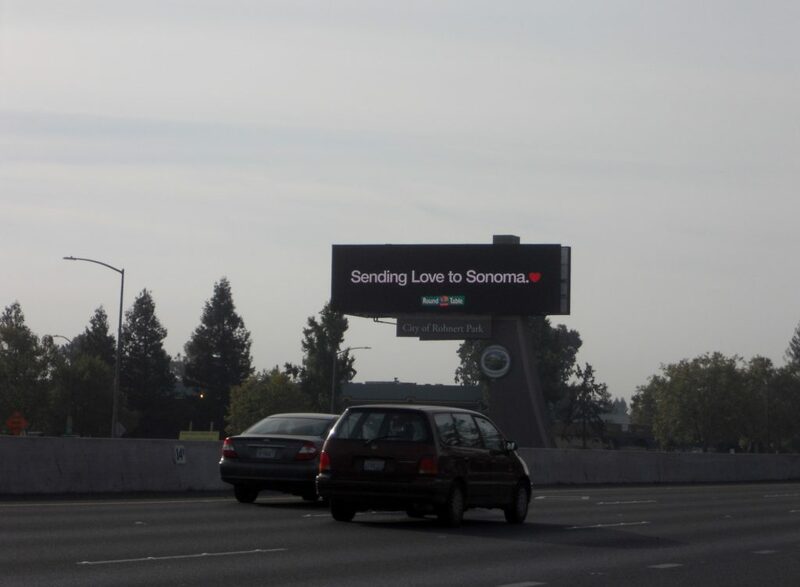 To all our family, neighbors, and friends throughout Sonoma County, Veale Outdoor Advertising stands with you. We would like the thank all the first responders. What an incredible response from fire fighters, police officers, sheriffs, the National guard, emergency medical services, volunteers, and everyone who was involved in helping our community. We have never been more proud to be a part of Sonoma County. Veale would also like to thank the businesses, non-profits, organizations, and individuals that stepped in to help our community in so many ways. From holding benefits to offering those affected by the fires a warm meal to donations of all types, our community has gathered together in an incredible show of strength. Veale was happy to help by broadcasting messages of support to the thousands that drive past our billboards every day. As a family owned and operated local business, we all have been directly or indirectly affected by the fires. We are heartbroken to see the devastation in our hometown, but encouraged by the incredible outpouring of love and support we see everywhere. 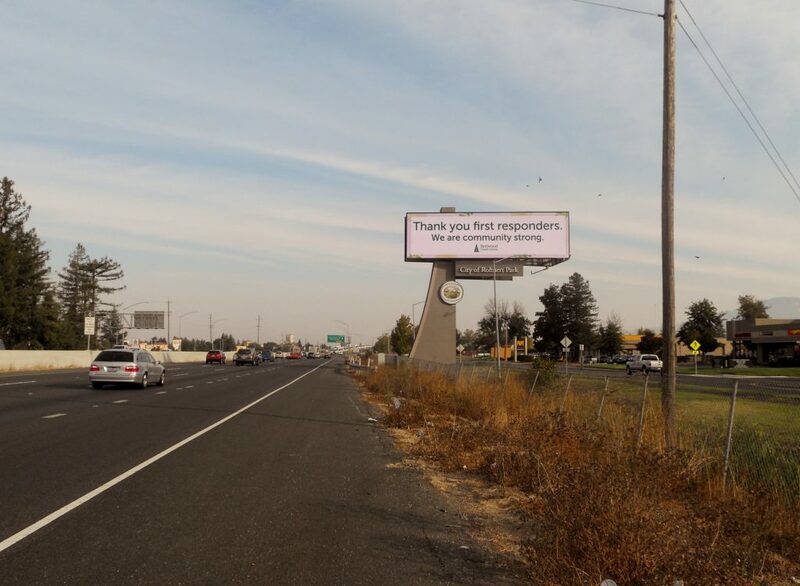 Local businesses and organizations were able to use our digital billboard to spread information regarding benefits and donation centers, thanks to first responders, and messages of love. We have proudly served Sonoma County for the last 35 years. Through the smoke, our message of love can be seen. We have brightened to see people opening their homes to near strangers, donating time to sift through ashes, and the outpouring of donations that Sonoma County has received from our surrounding areas in California and beyond. It is incredible to see that local businesses, residents, basketball stars, government agencies, rock bands, and multi-national conglomerates have joined forces to contribute to fire recovery efforts. There is a long road to recover ahead but know that Veale Outdoor Advertising stands with you. 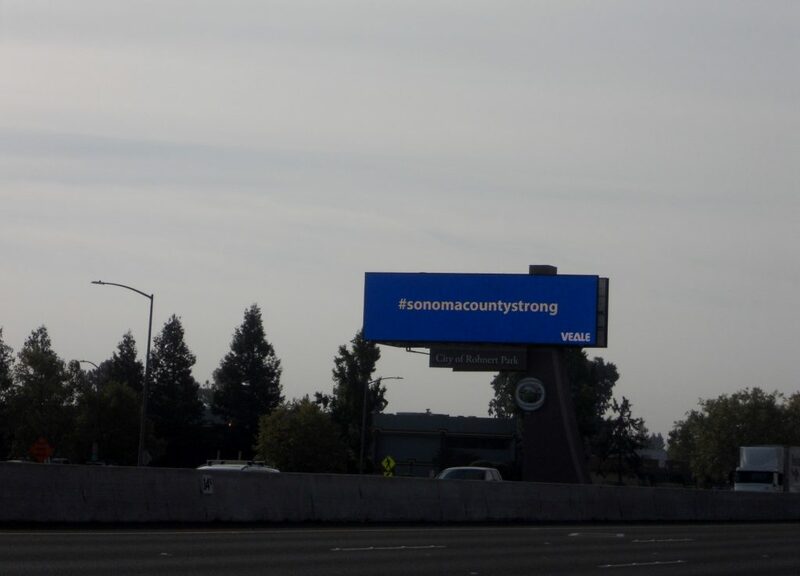 We remain #sonomacountystrong.